The snapshackle is a device that releases with a trigger, or pin, under extreme loads. Made of stainless steel, these can be found at any marine supply store (boat store). 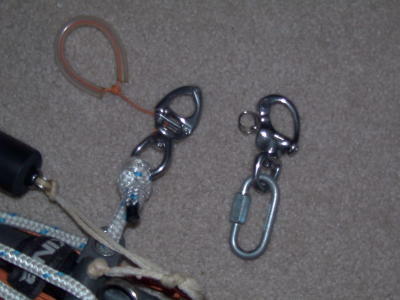 The best one to use is the lever-release shackle pictured to the left in the photo below. 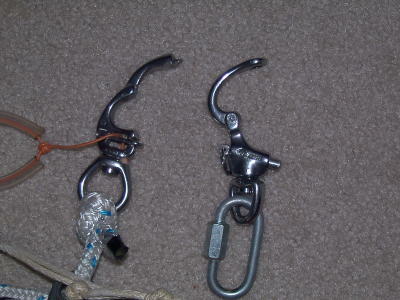 The shackle releases from the lever very easily, so no matter how much load is on the kitelines, the shackle is still easily released, freeing you from the kite. The pin release shackle to the right releases using a pin. The pin can get “macked” when the load increases so the additional fricition on the pin from the load (up to or greater than three times your body weight) will make it very difficult to release from the kite. The gate is also manufactured such that its geometry can get caught on spreader bars when released in a certain position. Make sure to use a metal on metal attachment. Using a steel ring will be the best. The photo below shows the gates opened. The pin release gate is wider and one-piece, making it easier to catch. The pin release shackle is cheaper, but your life is worth the additional $30 cost.